Poquoson is a small Virginia town that's big on charm. 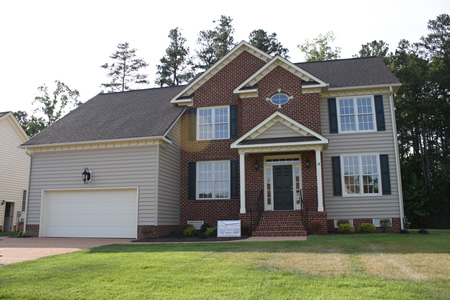 Here buyers can find the new homes they've been searching for without leaving Hampton Roads. Located northeast of Hampton, Poquoson sits along the banks of the Poquoson River at the mouth of the mighty Chesapeake Bay. Chartered in the year 1631, this town's history goes way back. Native Americans, called Algonquians, were the first to inhabit this special place but they couldn't keep it a secret from settlers forever. The homebuyers of today can find lovely residences in this area which has, in many regards, remained unchanged for hundreds of years. There are such lovely towns and cities throughout southeastern Virginia, what makes Poquoson stand out? It could be the extra friendly locals, the inviting atmosphere, the waterfront scenery, the close proximity to metro areas or the low crime rate. This quaint, little town has everything residents need and nothing they don't. Homes in new developments are available as well as older houses in established neighborhoods. The Poquoson Seafood Festival takes place on the third weekend of each October. This annual highlight is one of the region's most anticipated events. While visiting, tourists enjoy milling around in some of the quaint shops, art galleries and museums. Relocating to Poquoson offers newcomers many choices when it comes to finding the right homes. Like living by the water? Buyers can build their dream homes on river, bay and marsh front lots that provide scenic settings and the perfect environment for making memories. Virginia homeowners can catch dinner right off the shore of their properties when they can access one of the local bodies of water. Searching for a new home development? Don't let this small town fool you. The Lakes of Poquoson and Island Cove are two prime examples of pre-planned communities that possess a casual sophistication. Buyers continue to flock to these subdivisions because the construction is high quality, the area is divine and the features are first-rate. When it comes time to find a home in Poquoson, the best course of action involves locating a reputable real estate agent. Our agents know the Peninsula area and are prepared to do what it takes to find clients the homes they desire. Why deal with all of the hassle involved with house hunting when a qualified agent will do it instead at no cost to buyers? When our agents are on the trail of new homes in Poquoson or anywhere in Hampton Roads, they find them in record time.